A montage of short clips of Frida Kahlo set to Esa Noche a song by Café Tacuba. We see Kahlo working in her studio, as well as talking with her husband Diego Rivera and posing with her lover Leon Trotsky. Frida Kahlo in 1932, photographed by her father. Frida Kahlo de Rivera (1907 – 1954) was a Mexican painter, best known for her self-portraits. Her work has been celebrated in Mexico as emblematic of national and indigenous tradition and by feminists for its uncompromising depiction of the female experience. Mexican culture and Amerindian cultural tradition are important in her work, which has been sometimes characterized as naïve art or folk art. 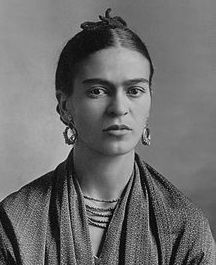 Her work has also been described as surrealist, and in 1938 André Breton, principal initiator of the surrealist movement, described Kahlo’s art as a “ribbon around a bomb”. Frida rejected the “surrealist” label; she believed that her work reflected more of her reality than of her dreams. She lives in me. She lives in our hearts! To see this, is to Love! Thank you. What a treat! What a beauty! What a talent! Reblogged this on Hetty Startup at Wellspring House. This entry was posted on June 6, 2015 by Vox Populi in Art and Cinema, Music, Opinion Leaders and tagged Andre Breton, Diego Rivera, Frida Kahlo, Leon Trotsky, Mexican artists, music, Opinion Leaders, Self-portrait with Monkeys, Video.